1. Disproportionately high costs of trading within the region arising from poor transportation and logistics infrastructure, as well as inefficient trade facilitation Latin American integration is still weighed down by relatively high trade costs, mostly associated with geography, but exacerbated by the poor quality of the region’s hard and soft infrastructure. While addressing hard infrastructure represents an ambitious agenda due to the size of investments needed, more attention could be given to the soft components related to improving trade facilitation and border management. For instance, the implementation of the Trade Facilitation Agreement represents an opportunity for countries to strengthen inter-agency coordination at the border and enhance public/private sector dialogue on trade facilitation. These are measures that can lead to the reduction of trade costs. 2. Complicated and non-transparent non-tariff measures Non-tariff measures refer to all measures other than tariffs that impact the free flow of goods and services across borders, and include technical measures related to product standards and quality specifications, such as sanitary and phytosanitary standards and technical barriers to trade. They also include measures such as import licensing, price-control measures, subsidies, and rules of origin. 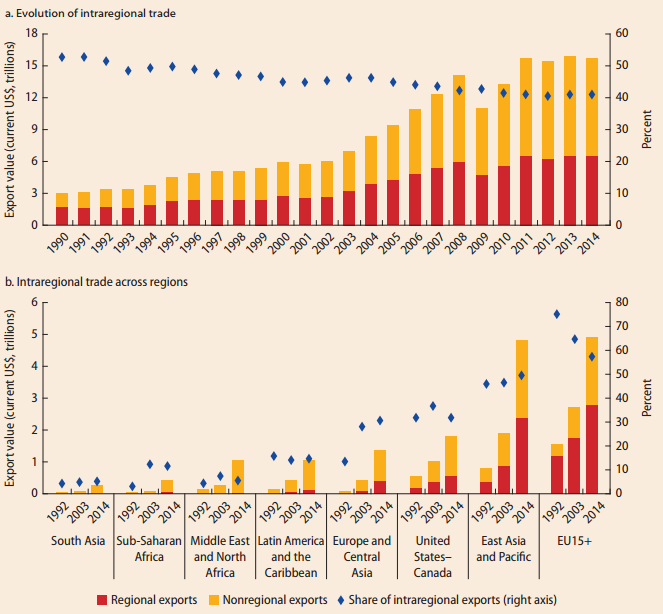 Initiatives to minimize the trade distortions associated with these measures – many of them with perfectly legitimate objectives – can have a large impact on Latin America’s competitiveness. 3. Regulatory constraints to trade in services Opening up to trade is a key mechanism for attracting foreign direct investment and increasing competition in services sectors. It is necessary, however, to ensure that more open trade is coordinated with regulatory reform so that appropriate regulations are in place that address relevant market failures and encourage the competitive provision of services.